Canadian 5000m record holder Jeff Schiebler, is challenging all running related businesses to match his offer of donating $1000 to charity should fellow Canadian, Cameron Levins take down his record time of 13:13.96. When asked about his chances Levins said, "I'm just looking to compete well with the leaders in my first Diamond League event. I really hope to walk away with the Canadian record, but I believe that will come if I just hang tough and kick hard. It is so classy of Jeff to offer up a charitable donation if I break his record, but I'm not going to worry about it until after the race." Levins’ current personal best at the distance is 13:18.29, less than two seconds from the record. He also owns the second fastest 10000m time of 27:27.96. According to the well-known McMillan calculator, 27:27 is equal to running 13:13. Levins from Black Creek, BC competed in the 2012 London Olympic Games in both the 5000m and 10000m distances. 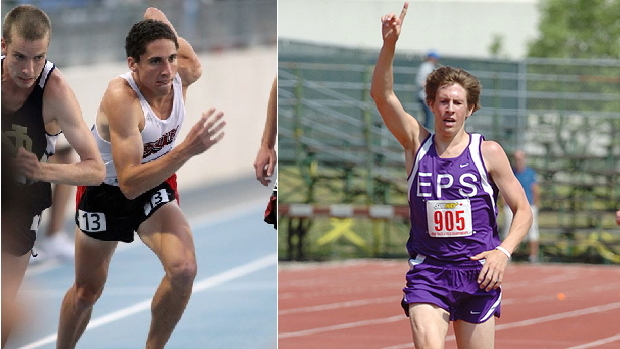 He is an NCAA champion as well as Canadian National champion on the track and in cross-country. Levins signed with Nike in June of 2012. Schiebler from New Westminster, BC has retired after a long and competitive running career and is now a firefighter. He is a five-time national champion in the 5000m and won a bronze medal at the 1999 Pan American Games that took place in Winnipeg, Manitoba. Asked about why he decided to give (rather than receive) on his birthday and how the idea came about, he said, “I have been volunteering with a former distance runner, Matt Johnston, who has been coordinating run clubs for inner-city youth since 2003. So, you can say that this idea came about over the past ten years. Matt was working in the downtown eastside and at one time, we were able to get 170 inner-city children and youth into the Sun Run. Click here to read more on Johnston's and Schiebler's work with youth.